To the Zoo! Part 1 « Comics! Games! Anthropology! Last week while the students were away I decided to go somewhere in Lima I’ve never been before. One of my revelations during this year’s trip is that Lima is becoming my comfort zone. That is good of course, because my familiarity with the city makes it easier for me to get around and get things done. I also came to realize that in a way I’m not being challenged as much as I want to be. I guess it’s the part of me that was so taken by the cultural anthropology class back in 1998; sometimes I want to see new things and not be in my comfort zone. While some people get culture shock, I like the newness of things where all of my assumptions are out the window and I have to participantly observe to get by. Anyway that’s why I decided to go El Parque de las Leyendas (~Legends Park), where the zoo is. I’ve avoided going there before. The previous Lonely Planet guide said it wasn’t very good, and actually kind of creepy. The current edition is more impartial. What sold me on this attraction was that the zoo is comingled with archaeological sites. How could I -not- go? I guestimated what bus routes would be the most convenient. Not to pick on the Lonely Planet guide, but despite what it says, it turns out the words painted on the side of each bus or van is actually a very accurate description of its route. That is, if you know enough about Lima’s zones and main streets, those words make perfect sense. Actively trying to remember these strings of place names also gave my brain a decent concept of where to go to take a bus to a given location. 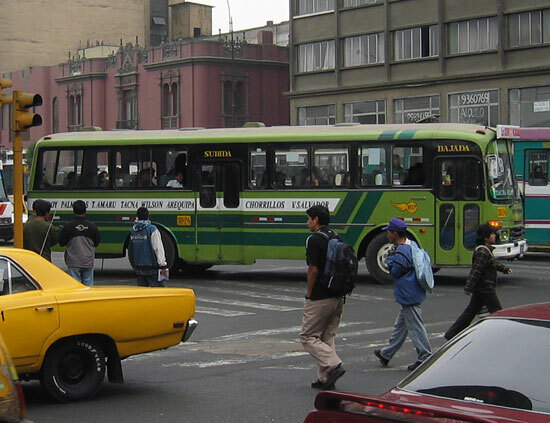 Luckily, the Villa Rica is within blocks of major streets going in every direction, so it is no problem going to where the buses are. I took a bus going westward towards the Pacific Ocean. It got off the bus at the Pontifica Universidad Católica del Perú. I was still a few blocks away from the zoo, but I planned for that too. I simply hailed a cab to take me that short distance. The smart part of this plan is that, if I took the cab from the hotel, it would cost around $3. A bus ride is usually 30 cents. Getting “within range” then taking the cab costs around $1.25. I basically cut the cost of getting there in half. Sure, $1.50 isn’t much, but here very sol counts! It was around 9:30AM when I got to the zoo. Besides a few lines of school kids, I was the only visitor. The zoo is famously divided into 3+1 sections. Three parts, reach representing an ecological zone in Peru (coast, mountain, jungle), and a fourth for international animals. I took a walk around Huaca San Miguel (a huaca is basically the generic term for an archaeological construction) and ended up in the international section. This was definitely the oldest part of the zoo. The cages had concrete floors and metal bars, a style that was obsolete in the 80s. 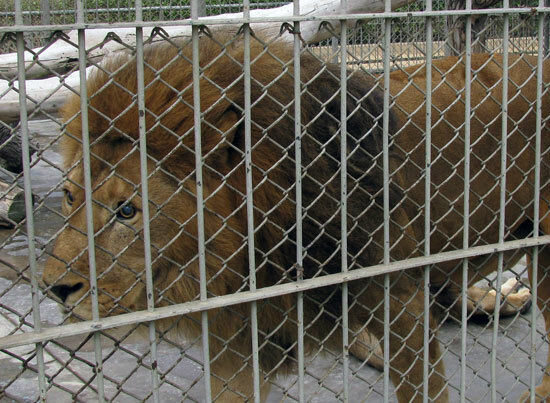 The male lion was pacing back and forth of it’s tiny cage, with a shellshocked look in his eyes. My heart sank a little. I took a walk around the international section. I was the only visitor there so it was eerily quiet, except for the animals. I passed a few zoo staff preparing for the day. In typical Peruvian fashion, they greeted me warmly as I passed. After passing the tigers, ostriches, giraffes, and hippos I entered the jungle section. So this is where the money has gone! The jungle exhibits were fantastic. The tortoises had an enclosure fit for several lions. 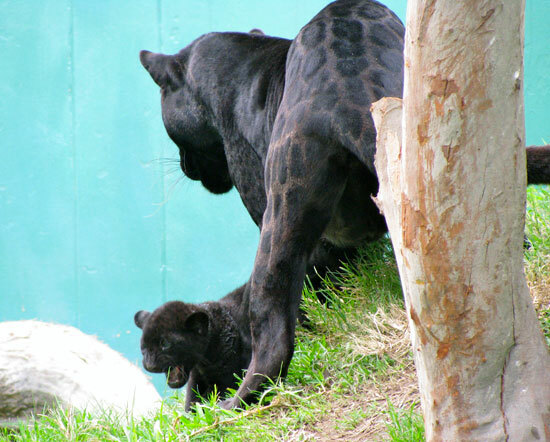 The black panther and its tiny baby also had an extremely spacious exhibit. I started to think that the lions must have gotten some zookeeper angry! As it turns out, a look at the zoo map shows that the big cats are getting their own exhibit next. Whew! I felt a lot better about this zoo. Leaving the jungle I went to the mountain section. True to its theme, there were lots of stairs and ramps. An archaeological site loomed over one side. This quarter of the zoo had all of the llamas and alpacas. The andean condors had an enclosure which may just be a tad too small (they did have room to soar however briefly from one side to the other). The last section I saw, the coast, was the smallest. There were literally four animals there: sea lions, Humboldt penguins, some sea birds (I lumped them together), and andean foxes. (Counterpoint: the official website lists 49 species). I wasn’t too enthused with the coastal fauna anyway, except the foxes which were really cute, so I kept going. Kept going? But I saw all four sections! Actually the Parque is far larger than just the zoo….